Have you found an online vendor selling St. Nicholas Abbey 18-Year? 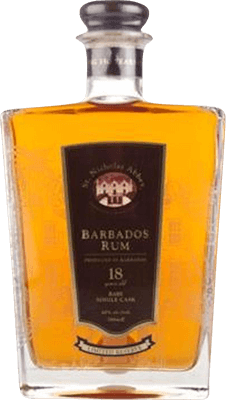 You can recognize the Barbadian soul and profile, but to me, it does something that no other rum does. It has some kind of x-factor that just sets it aside from every other rum. It might be an acquired taste, but once your there, it probably doesn't get any better... especially if your into pure, unsweetened bajan rum. It's amazing craftsmanship. The extraordinary 15 year little brother has evolved from a slightly frail and very delicate beauty into something slightly more refined, full and complex, without going overboard. This one just blows my mind every time I have a glass. As with the 15 year version, it's a little hard to describe the feel of this rum, but I'l give it a try. Given time, the nose slowly greets you with a broad palette of notes. I pick up pineapple, banana, faint wooden lacquer, oak, sweet tobacco, hay and sugarcane juice. At the risk of sounding a little romantic, it's simply a beautiful symphony. These notes follow through in the mouth and is supplemented by oily leather, roasted hazelnuts and a slightly spicy tingling. The finish is very long with a buttery and nutty character. The balance is fantastic. I'm amazed by it's delicacy. It's expensive but absolute luxury and to me worth the price. If I could only choose one rum for the rest of my life, this one would probably be the first one coming to mind. 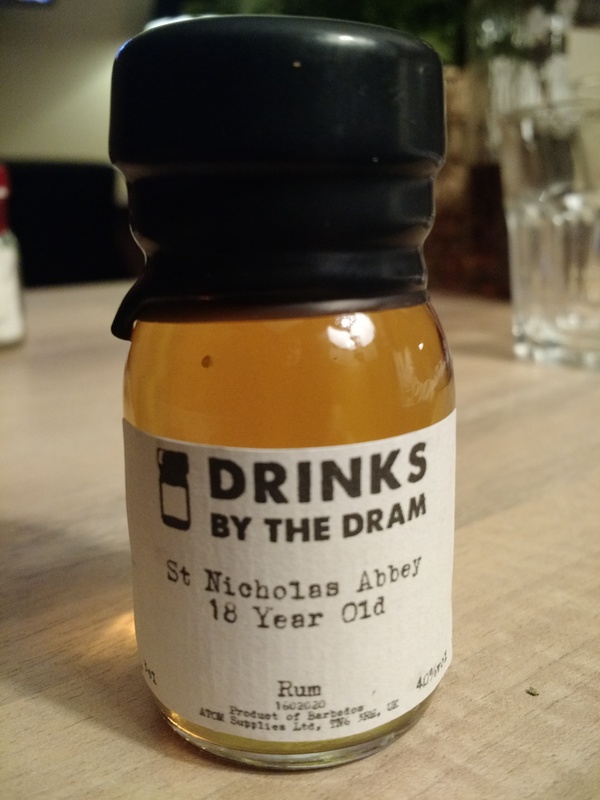 It's no secret that it's originally a foursquare distillation, so let's hope to god that the very talented folks at st. Nicholas Abbey manage to recreate the miracle with there own new distillations. Fingers crossed. This is so different from the sweet heavy christmas cake rums I usually love. This is a relaxed, sitting watching the sun and waves and feeling the breeze. Leave it 20 minutes in a Norlan glass and then enjoy. What does it taste like? I wasn't paying attention. Whatever the other guys said. In 3 months it's due to be renamed the 20 year old - already one barrel is and that's supplying the 20cl white/5/15/20 gift pack bottles. Note there is also now a new 5 year old cask strength and a overproof of the white rum both of which are excellent. And the barrels are running out for this 18/20 yr old. Sinds 2006 is de Abdij in bezit van de Warren familie, die 350 jaar oude recepten gebruikt voor hun Rum. Daarom hebben ze ook nog geen echt oude rum. Deze 18 jaar oude komt van de Foursquare Distilleerderij en heeft een paar jaartjes gerijpt op de abdij. Dit is een hele mooie Bajan rum. Zacht, licht zoet en droog. Tropisch fruit, tabak, hout. Geen suiker en of kleurstoffen toegevoegd. Even the smallest drop on your tongue will bring pleasure. A smooth and very richly flavored rum with subtle hints and goes down your throat like if it was lubricated by wd40. Excellent. I had the pleasure of visiting the St. Nicholas Abbey distillery, and tasted the 5-year and 12-year rums (both of which were great). After the tasting, I purchased an 18-year bottle and patiently waited until arriving home to taste it. I wasn't disappointed! The flavor of the rum is so complex, and almost hard to pinpoint what flavors came at me first. It's not overly sweet, but starts off with a taste of pineapple, then a bit of raisin, then a deep wooden oak flavor. It's not the typical flavors that would pull me into a rum, but it seemed to really work here. The Warren family are good people, and Simon led our rum-tasting event. He did a great job of explaining the rums, telling jokes, and entertaining those of us on the tour. We had a great time! Nice aromatic nose with vanilla, flowers, citrus and spice. The mouth feel is soft and round, and holds a long time. It’s lighty sweet but in a gentle way, there is a little bitterness mid-way that lags a bit. Very good sipping rum. I cannot say more than has already been posted here. This is without a doubt one of the finest distilled spirits in the world. I have sampled as many as I could over the past 44 years, this is my rum of choice (when available). I am not a fan of Barbados, so I will be looking for a way to St. Nicholas Abbey on the dark side. Enjoyed a glass of St. Nicholas Abbey 18y while vacationing in Versailles. Okay bottle design, but could be much fancier taken into consideration how ridiculously expensive this rum really is. Color is deep amber. Very strong whisky flavors to both nose and palate. A hint of burn at the end. Add 2 points if you like your rum aged 18 years in a whisky barrel. Otherwise a score of 7 is more than generous for this whisky rum. Not my cup of tea. It is from Barbados what is some kind of quality proof, but this one is different, slightly spicy and leathery. But amazingly smooth and surprising. This is one of the better bourbon aged rums I've tried, except I'm not really a fan of bourbon aged rums. Eighteen years of bourbon barrel aging makes bourbon the predominant flavor. It's a very smooth rum, with additional smells and tastes of spice, pine, tobacco, leather, and a hint of oak, vanilla, brown sugar, and cinnamon. If bourbon aging is for you, you'll likely love this rum. But bourbon aging isn't my style. I'm curious to find out if I'll like their younger rums better, as those should have less bourbon and more rum flavor. Edit: I tried the St Nicholas 15 year, and I ever so slightly prefer this, as the 15 year also has a very heavy bourbon influence, but this is a little more sophisticated with the 3 extra years of aging.